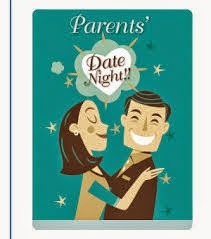 Let’s be clear; date night before and after children are two very different concepts. I’m talking planetary differences here. With maybe two similarities: one: falling face down onto the bed upon returning home and second: the absolute zero removal of make-up before falling face down onto the bed upon returning home. After that the differences are world’s apart. A whole year could pass before both of you are actually out together and not taking turns because Friday night is his night and the first Saturday night of every fourth month is yours. Anyhow, here are a few do’s and don’ts to help you out in the event you have a date night this weekend. Whoo hoo! Allocate a time to get “the kids” conversation out of the way. Do this before you even leave the house. This one is inevitable and if you are not careful, will spend the entire night discussing picky eaters and potty training. I suggest using your first drink as a time limit. Order a large one just in case. Wear something nice. Not that pre-baby dress. You don’t have a pre-baby body anymore. Take my word for it - said dress will only magnify the fact. Bend over at your peril. Allow your other half to go to the bathroom alone. You will only be the cause of many raised eyebrows, lots of scandalised tuts and possibly getting turfed out of the restaurant. You know you have forgotten yourself again and are just following instinct but the other patrons don’t. He can wipe and wash his own body parts all by his very own self. Write this reminder on a napkin if you have to. Pace yourself. By all means drink wine. Just don’t drink all of the wine. You do not possess the same staying power you once did. You are allowed to blame the kids and the toll they have taken on your body. Drinking yourself under the table or onto the top of one is never a good look. Be careful! Listening to a similar topic of conversation on the Ray D’Arcy show recently, lots of babies appeared approximately 10 months after such date nights. These shocked parents report having absolutely no recollection of their kids’ conceptions. Keep looking at your phone. The sitter will ring if something awful happens. Unless of course you pertain to the “a watched pot/phone never boils/rings” adage. Then by all means stare the hell out of it. Cut up your other half’s meat for them. Or blow on their food. I know this could be passed off as force of habit but get a hold of yourself. The kids are at home. Worry you will have nothing to say. Even if the first 10 or 15 minutes pass in silence, this one is often a slow burner. If however, a half an hour has passed and you are still looking anywhere except at each other, “what’ll we buy when we win the lottery” is an excellent ice breaker. Yelp at the price of the house white. Yes, the supermarket does two for that price but you are in an up market establishment now and inflation prices (remember them?) can reflect the length of your absence. It’s date night, remember? Enjoy it. You’re worth it! Forget to go home. Your kids need you and your head won’t thank you in the morning. And you’re home! Chances are it is well before midnight. 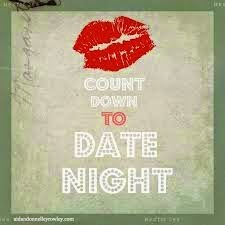 Chances are one or both of you suggest making date night a regular event. Chances are one of both of you agree whole heartedly whilst at the same time knowing another 6 months could pass before either of you get your finger out again. Still it’s the thought that counts. When my second was two we made a pact to go out every Saturday night, even just for a walk. Seventeen years later we still go out most Saturdays, but at least now we have free babysitters. We are no longer as tired as we were, and thankfully we have yet to run out of conversation. In a week or so we are going away for a night together. It's almost a year since we did that, and I can't wait. See, I KNEW there were people like you out there. I don't know whether to be envious or jealous. Especially love the free babysitters part. Wait! I just like the babysitter part!